How can I link all my calendars? Link all your calendars in FreeBusy to share your combined availability. Sign up or sign in with one of your calendars. 3. Provide the email address associated with your calendar. 4. Confirm provider and sign in. After you sign in with this calendar, it will be automatically linked to your account. To see which calendars you've already linked, visit the Account page. 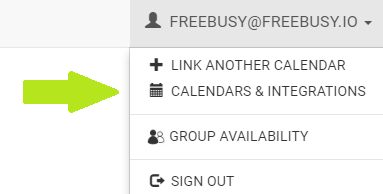 Note: FreeBusy combines availability data from all your connected calendars. You can share your availability using any email address that you’ve linked. We’ll always show the same availability regardless of email address used.